Doing the rounds on Facebook recently was a story broadcast on Channel Seven News (Brisbane) from the 22nd of June 2015. It was the story of a previously healthy young Melbourne woman who suffered a stroke at work. She was simply sitting at her desk, and was suddenly unable to move her arm to control her mouse. Because of the quick thinking of one of her co-workers, Melissa James got urgent medical attention and appears to have made a very good recovery. Channel Seven’s angle on this story was that Melissa’s oral contraceptive pill Yasmin was to blame. Perhaps it was. Perhaps it wasn’t. No one can fairly say from the limited information that was given in the two minute clip. The report also suggested that Yasmin was responsible for strokes in countless other women, stating that Bayer, Yasmin’s manufacturer, was paying out billions of dollars in damages, and that Yasmin caused a “six-fold increase in strokes”, potentially putting hundreds of thousands of women at risk. That the oral contraceptive pill is associated with an increase risk of strokes is not in contention. Strokes and blood clots are well known to be side effects of the pill. Remember, any drug that has an effect is also going to have side effects. The oral contraceptive pill is no different. The question then becomes: Is the pill still safe to use, or should women be ditching it in favour of other forms of contraception? To answer that, one has to start trawling through statistics. Don’t worry, I promise there won’t be too many numbers, because statistics make my brain hurt. 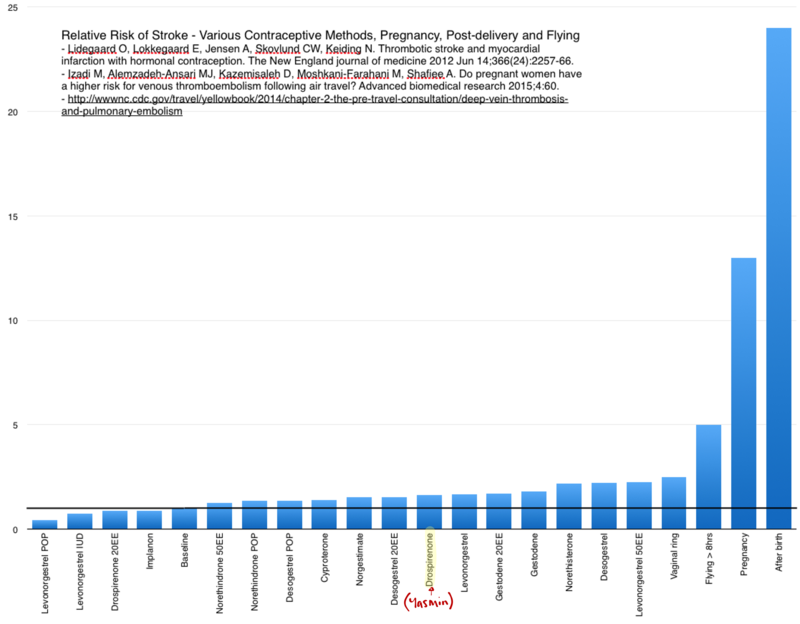 Instead, I want to show you a few graphs, because it’s actually much easier to understand the risk of the pill if you have the right perspective. One of the largest and most recent studies on the risk of strokes and the oral contraceptive pill was done in Denmark in 2012 . Lidegaard and colleagues followed 1,626,158 women over a decade, and analysed the risk of strokes while using different forms of hormonal contraception. The sheer number of women involved in the study make the statistics very strong. Overall, women taking Yasmin were 1.64 times more likely to have a stroke than the average woman not taking any contraception. 2. A relative risk of 1.64 is the same as saying there was a 64% increase in stroke risk. This still sounds bad for Yasmin … until you look at the risks for some of the other pills discussed in the study. 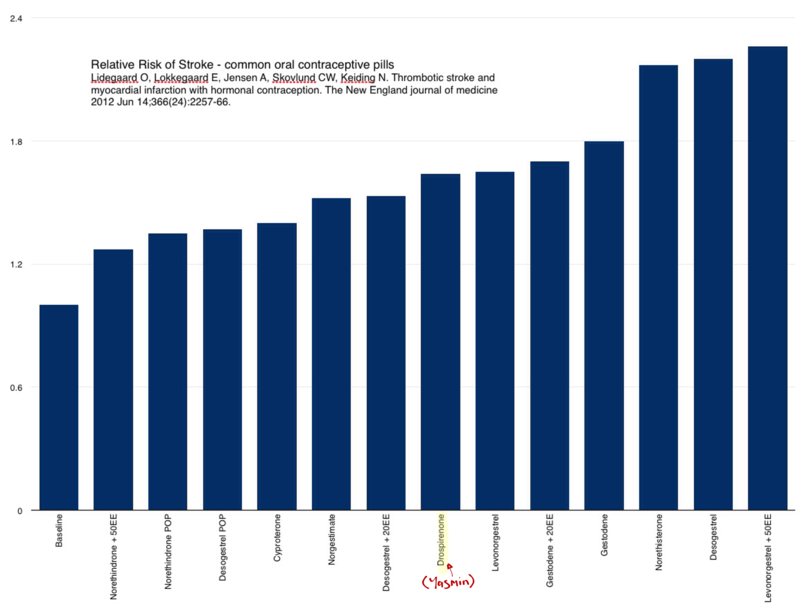 The graph shows that there are actually quite a few contraceptive pills that have a higher risk of stroke than Yasmin. According to the numbers of Lidegaard et al, Yasmin is not all that spectacular – just somewhere in the middle in terms of the risk of stroke, compared with common pills. Though when you factor in a broader array of pills, other contraceptive methods, and other everyday situations for women, the risk of stroke from Yasmin, or any pill for that matter, doesn’t look bad at all. The risk of stroke from taking Yasmin is nothing compared to the risk of stroke in the few weeks after birth, but there are no news reports of the dangers of stroke after having a baby. There’s probably a couple of reasons for that – post-partum strokes are brought about by babies, which are cute and cuddly, and not by multinational drug companies, which are repugnant and evil, and much more newsworthy. It’s also because even though the risk of stroke in the few weeks after delivery is nearly 25-times higher than the stroke risk for an average non-pregnant woman, that number is still so small on average that the overall chance of getting a stroke in the few weeks after delivery (in statistical parlance, the “absolute risk”), is tiny. In the Lidegaard study, there were 2260 strokes in 9,336,662 person-years. That’s a rate of only 24.2 strokes for every 100,000 women in a year. Even though the risk of stroke after birth is still very high, it hardly creates a impression on the graph of absolute risk. 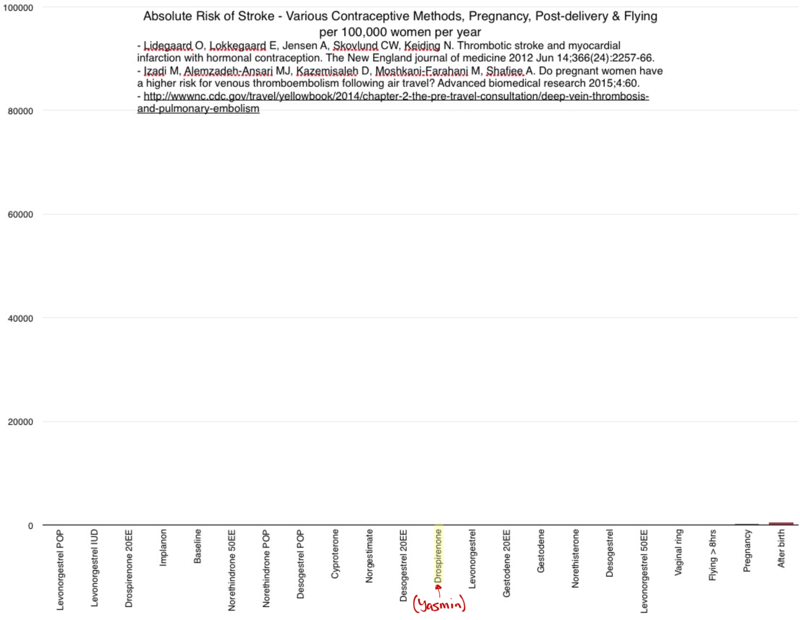 And because the risk from most contraceptives is quite a bit lower, they don’t even make a blip. Thinking about it in a different way, even with the increased risk of taking Yasmin, for every 100,000 women taking Yasmin for a year, there will only be an extra 16 strokes on average compared to the general population. 16 in 100,000 … that’s like trying to find a straight middle-aged man at a One Direction concert. 1. Always take health stories on the news with a pinch of salt. The media often use a liberal amount of poetic licence to sell their stories. I’m not sure where Channel Seven got their source material, but it doesn’t seem to fit the data that I’ve unearthed in a quick search of the medical literature. The story of Melissa James is newsworthy as an exploration of the struggle of a young woman who suffered a tragic complication, and I’m really glad for her that she seems to be winning that battle. But her story can’t be extrapolated to every other woman on Yasmin, or any other pill for that matter. The statistics suggest that experiences like that of Melissa James are thankfully rare. 2. There is more to the oral contraceptive pill than just the risk of strokes. The oral contraceptive pill has a number of other potential complications, and each form of contraception needs to be matched correctly to the woman who’ll be taking it. This is why the pill remains on prescription in Australia (and most other countries), not sold off the shelf at the pharmacy or the supermarket. If you have any concerns about your risk from the pill, or any other method of contraception, see your GP for a full assessment. Lidegaard O, Lokkegaard E, Jensen A, Skovlund CW, Keiding N. Thrombotic stroke and myocardial infarction with hormonal contraception. The New England journal of medicine 2012 Jun 14;366(24):2257-66. Izadi M, Alemzadeh-Ansari MJ, Kazemisaleh D, Moshkani-Farahani M, Shafiee A. Do pregnant women have a higher risk for venous thromboembolism following air travel? Advanced biomedical research 2015;4:60. Centers for Disease Control and Prevention. CDC Health Information for International Travel 2014. New York: Oxford University Press, 2014. Declaration: For the record, I declare no conflict of interest in the publication of this post. I do not receive payment, commission, or any kind of gratuity, from Bayer, or any pharmaceutical company. I do not directly own shares in Bayer or any other pharmaceutical company. Nor do I have any professional links to any pharmaceutical company. I wrote this post to promote rational use of medicine, not to specifically promote or defend one particular brand of medication. This entry was posted in Biological and tagged Bayer, contraceptive pills, Melissa James, oral contraceptive pill, Seven News Brisbane, stroke, the pill, yasmin by cedwardpitt. Bookmark the permalink.